I have an extra ravpower 6700 mah 5v portable charger and an easyacc 15W solar panel charger. I'm considering trying a 5v node where the panel charges the battery and the battery provides continuous power to a nano (or apm using sundberg84s easy/newbie pcb). I plan on the node and components being super low power (mostly soil sensors, rain sensor, air quality, maybe wind) with high sleep times. Theoretically, assuming no overheating and no outdoor heat/water leakage variables to damage components wouldn't this go forever or until a component died? I did validate that the battery pack can be charged and provide power simultaneously (2A in /2A out). here is the battery pack and solar panel. @rchamp I guess it will work but you have a lot of (expensive) overhead in the link you provided. 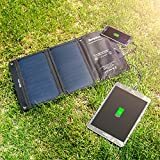 These solar chargers a not built for long lasting low power applications but rather for charging phones and other mobile equipment. A solar panel, charging circuit and battery and low power node is a much better solution, and less chance of dying components. My suggestion is to browse @ceech his postings. That would give you some good hardware ideas and solutions. But the power bank can't be used forever. Batteries have final charge/discharge cycles after which their capacity start to decline. In case of lithium batteries which are used in power banks, that number is around 500.
understood. i just happened to already have these as 'extras', so i figured i'd build a node and give it a whirl. I'll definitely do some more research on @ceech his postings.